U-512 was surprised on the surface at 11:50 GMT on October 2, 1942, by a B-18A plane of the 99th Bombing Squadron, in position 05º 50"N - 52º 25" W. According to her report, the plane sighted the U-boat on course 1200 from a distance of 15 miles, and attacked from dead ahead at 156 knots with two Mark XVII's and two Mark XXIX's dropped from a height of 50 feet. 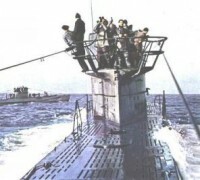 The first drop was 40 feet short and the rest were in train over the U-boat. Oil and bubbles appeared immediately and lasted 30 minutes. Oil and air spouted from the surface in large quantities for the first three minutes. After three hours there was an oil slick of six miles. One man was seen to rise to the surface shortly after the attack, and a raft was dropped to him. He succeeded in reaching it, and he was rescued 10 days later. He is the only person fortunate enough to have escaped from U-512. This sole survivor's account of the sinking follows: Shortly before the appearance of the aircraft he had ascended to the bridge for a smoke. There came a sudden cry of "Airplane dead ahead!" A crash dive was immediately ordered and the men on the bridge, now totaling five, tumbled below. Survivor went forward to his diving station which was at the valves in the galley. Almost immediately, and before the submarine was fully submerged, two direct hits were scored on the boat. They are stated to have struck between the 10.5 cm. gun and the galley. The force of the explosion flung survivor diagonally across the boat. He was injured upon hitting the opposite wall, wounding himself on the side from the hips down. At the same time a caldron of soup which was flung into the air landed on his head and caused slight burns. All illumination was extinguished except the emergency lights, which burned throughout. Water immediately rushed into the boat and survivor donned his escape lung only to find it useless, as there was no air in the flask. The boat settled rapidly. Survivor states that all tanks were blown and the boat's descent was checked momentarily, only to continue almost at once. The U-boat sank by the bow, which hit the bottom with an appreciable jar. The stern then also settled onto the bottom. The boat then came to rest almost level and with little or no list. The depth shown on the torpedo room depth gauge was 42 meters (137 feet). The water-tight bulkhead door to the bow torpedo compartment had been closed and as the water rose survivor worked his way forward and beat upon it with a fire extinguisher. It was opened to receive him. One emergency light illuminated the room which now contained 15 men. Development of chlorine gas commenced at once and men began to cough. 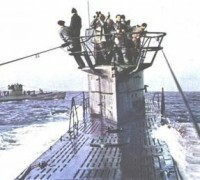 (It was stated that the chlorine gas was produced from the batteries of electric torpedoes -- not the main batteries.) Because of an unfortunate circumstance there were only four escape lungs in the compartment. A short time previously it had been discovered that the escape lungs had been improperly stowed and that the majority had become wet from the condensation in the boat. They had consequently been taken aft to the engine room to be dried out. Three of the men donned their lungs in the hope that they would act as gas masks. Survivor had possessed himself of the fourth. The air pressure in the compartment began to mount and speech became very difficult. An attempt was made to communicate with other compartments in the boat. One man rang the telephone to the after compartment but collapsed before the call was completed. Survivor picked up the dangling instrument and gave the crank another twist. He states that the after compartment replied with the simple statement "After compartment flooded" and all communication ceased. Men were now beginning to collapse rapidly from the combined effects of chlorine and high pressure. Some were bleeding at the mouth and ears. Survivor and a boatswain's mate decided to attempt to open the torpedo loading hatch rather than die from gas. The torpedo hatch was secured with a strongback as well as dogged shut. Standing at the top of the folding ladder they finally released the strongback and started to open the hatch. Since the loading hatch is at an angle there is no skirt at the bottom to facilitate escape. As the water rushed in, the two men became wedged in the opening and a struggle resulted. Survivor states that he gave precedence to the boatswain's mate, who had no lung. At any rate the mate was the first man out. It appears that he confused his direction and swam horizontally, only to lose himself between the hull and the superstructure. Survivor followed and after a short struggle succeeded in raising the grating over the torpedo loading hatch. He rose to the surface to find that his lung was beginning to burn his mouth. He thereupon discarded it, preferring to swim without it. After a period estimated by the prisoner to be 1-1/2 hours, an inflated life-jacket was dropped to him from the airplane. This was followed by a rubber raft, outfitted with water, a signal pistol, paddles and some 200 feet of line. This raft was his home for the next 10 days. His wounds began to fester, and the tropical sun added to his discomfort. The cartridges of his Very pistol were soon used up in a vain attempt to signal a passing aircraft and a tanker. In order to escape the heat he would spend a portion of each day in the water. Lashing the CO2 flask of the rubber boat and the now useless signal pistol together he fashioned himself a descending line. He claims that by this means he descended occasionally to depths where the water was a bit cooler. While there were sharks in the neighborhood his lot was already so unhappy that he was not much perturbed by their presence. He contented himself with giving one an occasional jab with a paddle as it came to investigate the raft. At one point he sighted a tanker on a zig-zag course which bade fair to bring it near to him. However, the next altercation of course took it farther away. Some time previously one of his two paddles had been carried overboard by a tropical squall. He had arranged it as a signal spar for a piece of rag. As the paddle would not propel him satisfactorily, he tied the line to himself and swam madly in pursuit of the ship, towing the rubber boat behind him. Toward the end of his stay on the raft he was attacked by birds which pecked him on the shoulders so violently as to leave permanent scars. He managed to secure two of these which he split and dried in the sun. As his provisions had run low he ate them, afterwards complaining slightly of their fishy taste. On the 12th of October survivor was rescued by the United States Destroyer Ellis in position 07.50 N - 56.05 W. The Ellis was on patrol and it was not until October 30 that the prisoner was landed in Trinidad, B.W.I. His strong constitution together with the medical care given him on board the Ellis had caused a quick and full recovery of his health. He reached this country by air on the 3rd of November, 1942.